A two-dimensional electron gas (2DEG) situated nearby a single layer of self-assembled quantum dots (QDs) in an inverted high electron mobility transistor (HEMT) structure is used as a detector for time-resolved tunneling measurements. We demonstrate a strong influence of charged QDs on the conductance of the 2DEG which allows us to probe the tunneling dynamics between the 2DEG and the QDs time resolved. Measurements of hysteresis curves with different sweep times and real-time conductance measurements in combination with an boxcar-like evaluation method enables us to unambiguously identify the transients as tunneling events between the s- and p-electron QD states and the 2DEG and rule out defect-related transients. Studies on single or double (lithographically defined) QDs in a two-dimensional electron gas (2DEG) were enormously successful using time-resolved single charge read-out by an adjacent quantum point contact [1–3]. However, these measurements are limited to low temperatures (<300 mK) in a dilution refrigerator since the weak spatial confinement results in an orbital level spacing of typically smaller than 1 meV and a Coulomb charging energy which is a few meV. In contrast, self-assembled QDs can exhibit strong confinement and localization energy , resulting in an orbital level spacing energy of up to 80 meV and Coulomb charging energy of about 20 meV. Therefore, self-assembled QDs could enable to study these transport phenomena at higher temperature. However, no corresponding read-out scheme—like a quantum point contact—was demonstrated yet which would enable us to scale the size of a QD device down to a single self-assembled QD. Up to now, the charge carrier dynamics is mainly observed in time-resolved capacitance measurements of large ensembles of self-assembled QDs [6–9]; a measurement method which is very unlikely to scale down to a single dot. Using a 2DEG as a sensitive charge detector in the vicinity of self-assembled QDs could enable to scale down the QD number to probe single electron tunneling and/or hole dynamics in a time-resolved manner. It is also of basic importance to understand the carrier dynamics and read-out scheme in a future QD-based Flash memories , where single charge-carrier read-out is desired. In this paper, we show that a 2DEG can be used as an efficient and sensitive detector to study the charge tunneling dynamics in an ensemble of self-assembled InAs QDs. Measurements of hysteresis curves of the transconductance of the 2DEG with different sweep times and real-time conductance measurements in combination with a boxcar-like evaluation method enable us to unambiguously identify the transients as tunneling events of the QD states and rule out defect-related transients. 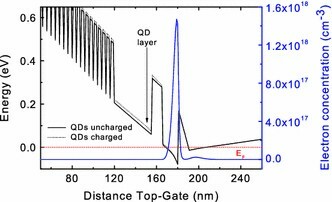 The developed evaluation methods and the favorable scaling laws of a 2DEG give us confidence to predict a time-resolved charge read-out of a single self-assembled QDs even up to room temperature in the future. The investigated samples are inverted high electron mobility transistor (HEMT) structures with embedded self-assembled InAs QDs which were grown in a molecular beam epitaxy (MBE) system. The QDs are separated by a tunneling barrier from a 2DEG, which consists of a 10-nm-thick Al0.34Ga0.66As and a 20-nm-thick GaAs layer (total thickness of tunneling barrier d t = 30 nm). The sample growth sequence can be found in Ref. [11, 12]. We have prepared Hall bar devices with a metallic top gate in order to control the charge state of the dots and the 2DEG. Hall measurements yield a charge carrier density and a mobility of the 2DEG of about 7.4 × 1011 cm−2 and 9,340 cm2/Vs, respectively. The dot density of the sample is about 8.3 × 109 cm−2. The conductance of the 2DEG is measured in a two-terminal geometry at a fixed source-drain voltage between VSD = 30 and 50 mV. All measurements have been taken in a He cryostat at 4.2 K.
First, we will discuss the strong influence of the charged QDs on the conductance in the 2DEG in hysteresis measurements which prepare a non-equilibrium state between the QDs and the 2DEG. Figure 1 shows the transfer characteristics of the sample, i.e., the conductance of the 2DEG versus the gate bias for three different scan times. The measurement cycle starts with a 200-ms-long discharging pulse (Vdepl = −1 V), which depletes the InAs QDs. Fast bias sweeps ( , 20, and 200 ms) from the depletion voltage upward to the filling voltage (Vfill = 0.6 V) follow. As a consequence, during the fastest sweep [see upper panel of Fig. 1], the QDs remain empty during the entire upward sweep and the 2DEG remains unaffected by the (empty) states of the QDs. Next, during a 200-ms-long charging period at a gate bias Vfill of 0.6 V, the QDs become completely charged. The charged QDs lower the conductance in the nearby 2DEG, resulting in the observed hysteresis. The hysteresis shows the difference in conductance between uncharged QDs (upward sweep) and charged QDs (downward sweep). A smaller conductance is partly due to a decrease in the charge carrier density n(depletion) and mobility μ (scattering) in the 2DEG as a consequence of the nearby charged QD layer. The hysteresis decreases by increasing the scan time and, hence, vanishes for sweep times longer than 200 ms, the longest charge carrier storage time in the QD ensemble [see lower panel of Fig. 1]. The measured hysteresis opening in the upper panel of Fig. 1 for a gate bias of 0 V is about 13%. A major problem in hysteresis measurements on QDs—including laterally defined QDs in a 2DEG—may be the existence of defect states inside or nearby the QDs. If the charge carrier storage time inside the defect states is longer than the scan time, these deep levels will also cause a hysteresis effect in the transfer characteristic. Balocco et al. have already observed a hysteresis effect on similar devices at room temperature and could relate the hysteresis to charge storage in such deep levels. Other groups require a light illumination to discharge the QDs [14–16] or measured hysteresis on laterally patterned electron channels [17, 18], however, could not rule out defect-related charge storage. We present here a simple evaluation method to rule out defect-related storage within the hysteresis measurement on QDs. A small hysteresis in the lower panel of Fig. 1 (a scan time of ) can be made visible by taking the difference of the upward and downward scan Gup–Gdown. Figure 2 shows this difference versus gate bias V g . Clearly visible is now a hysteresis in the conductance measurement which shows the signature of the s- and p-states of the QDs like in a standard capacitance–voltage (C–V) measurement [19, 20]. A scan time of 200 ms is longer than the average tunneling time of the electrons—as the hysteresis has almost vanished—and, hence, the QD states are in quasi-equilibrium with the Fermi level in the 2DEG. 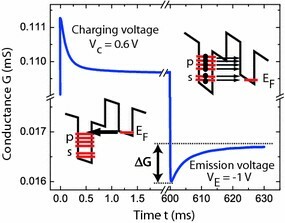 In this situation, increasing the gate bias from −1.0 V up to 0.6 V fills up the QD states step-by-step while the electron loss slightly reduces the conductance in the 2DEG. 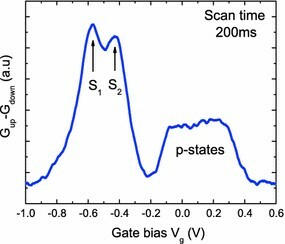 Taking the difference of the up- and downward scan is now similar to the first derivative of the conductance versus gate bias and visualizes the charging of the QDs state with the typical signature of the s- and p-states (cf. Ref. ). This method makes it easily possible to rule out a defect-related signal because such a signal would not exhibit the characteristics of the QD states. The observed maximum hysteresis opening at zero bias of about 13% is due to the influence of six electrons per QD on the conductance of the 2DEG. As the conductance is given by (with μ = charge carrier moblity and N 2DEG = charge carrier concentration in the 2DEG), the hysteresis effect can be due to depletion (changing the N 2DEG) and/or electron scattering (changing the μ) within the 2DEG. In order to estimate the influence of the charged QDs on the charge carrier concentration in the 2DEG, we used a poisson solver (http://www.nd.edu/∼gsnider/) to calculate the conduction band structure and the sheet carrier density within the 2DEG for charged and uncharged QDs. In a second step, we are able to estimated the mobility change in 2DEG. The result of the poisson solver is shown in Fig. 3, where the solid lines are related to a situation of uncharged QDs while the dotted line represents the band structure (black) and charge carrier concentration (blue) for QDs charged with six electrons. The QD sheet density has been measured to 8.3 × 109 cm−2 using atomic force microscopy. Clearly visible is an in energy-shifted conduction band for the case of charged QDs which reduces the number of electrons within the 2DEG, however, only roughly visible in the blue line in Fig. 3. This is equivalent to a screening potential (mirror charge) or depletion within the 2DEG due to the electrons inside the six QD states. The results of the calculation lead to a reduction in the two-dimensional electron density in the 2DEG from 7.4 × 1011 cm−2 down to 7.0 × 1011 cm−2, equal to a relative change of about 6 percent. A simple estimation can now clarify how many charge carriers on average are depleted inside the 2DEG if one charge carrier is added to the QDs. Taking the QD sheet density of 8.3 × 109 cm−2 times the maximum number of six electrons per QD yields a charge carrier difference of 5.0 × 1010 cm−2 for completely charged to completely uncharged QDs, which is 7 percent of the charge carrier density inside the 2DEG at zero bias. The band structure calculation before yielded a relative change of about 6 percent; hence, both values are in good agreement. This means, that—as expected—one charge carrier inside the QD roughly depletes one charge carrier in the 2DEG if no free charges are surrounding the QDs. Comparing the estimated value of about 7 percent in the change of the electron concentration inside the 2DEG with the observed value of 13% for the total change of the measured conductance leads to a second conclusion: the conductance change of the 2DEG is only partly due to a change in the charge carrier concentration; about 50% seems to have the origin in the change of the charge carrier mobility μ. Our estimation of an additional decrease in the mobility after charging the QDs with electrons is in contrast to a previous publication by Zhukov et al. . They observed an increase in the electron mobility for charged QDs; however, they used a sample structure with Si segregation from the delta doping into the spacer layer. These Si donors produce a strong disorder potential inside the 2DEG which is screened again by the charged QDs. Screening the disorder potential results in an increase in the charge carrier mobility. Our results are more in qualitatively agreement with the investigation of Ribeiro et al. . They observed a decrease in the mobility for increasing QD area density, i.e., for increasing number of charge carriers per unit area. The ratio between the number of charge carriers inside the QD (N QD) and the number of charge carrier in the 2DEG (N 2DEG)—which is the conductance change due to carrier depletion—is independent on the sample size and number of QDs involved. This estimation supports our conclusion that this technique could be used to study the carrier dynamics of single self-assembled QDs as successfully shown before for lithographically defined QDs even if the charge in charge carrier mobility is not temperature independent and not scalable to smaller sample sizes. 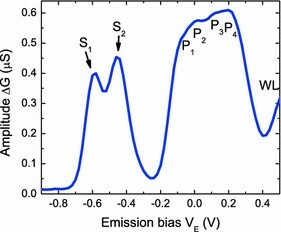 In the following section, we will present the results on the time-resolved conductance measurements and a “Boxcar-like” evaluation method which enables us in addition to identify unambiguously the memory effect and the observed transients as charge storage and emission of the s- and p-states of the self-assembled InAs QDs. Figure 4 shows the time-resolved conductance measurement of the 2DEG. 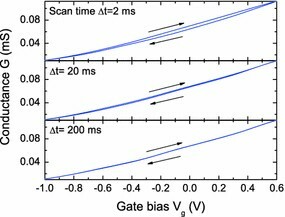 The time-resolved measurement starts with a 600-ms long-charging pulse (V c = 0.6 V) applied to the gate electrode. The Fermi-level E F is now above the highest (p-) state of the QDs, and the QD states are filled with electrons from the nearby 2DEG by tunneling through the barrier (schematically depicted in the left inset in Fig. 4). The charge carriers inside the QDs deplete the 2DEG. As a consequence, a decrease in the conductance can be observed time resolved in the first milliseconds in Fig. 4. At t = 600 ms, an emission bias of V e = −1 V is applied, which sets the Fermi level E F below the lowest (s-) states of the QDs (schematically depicted in the left inset), and tunneling from the QDs to the 2DEG takes place. Note here the different time scales for the emission and charging process, as the time window of charging transient is about 2 ms and of the emission transient 30 ms. The different time scales of the charging and emission transient can be explained as follows. By applying the charging pulses the Fermi level E F of the 2DEG is in resonance with the highest p-level of the QDs and charge tunneling into the highest p-shell occurs on a faster time scale of about 1 ms. Afterward, the charge carriers relax into the lower QD states, which is well known to be of the order of ps for electrons in self-assembled QDs . Due to this two-step process (tunneling and relaxation), only the tunneling time into the p-states is visible in the charging transients. In contrast, the emission transient is a multi-tunneling process, because electrons of every QD state tunnel out simultaneously with different tunneling times up to 30 ms. This maximum tunneling time is in good agreement with frequency-dependent capacitance–voltage (C–V) measurements on the same sample, which yield a tunneling time for the first s-electron of τ s1 = 6 ms. In order to study tunneling emission from a single QD state, we discuss in the following the charge selective operation . This method enables us to probe the electrical density of states (DOS) of the QDs and compare the results with results that were previously obtained from C–V measurements (cf. Marquardt et al. ). The charge selective operation starts with a charging pulse followed by an emission pulse that is similar to the previously discussed operation. However, the pulse amplitude is now set constant and should be as small as possible to assure that just a single QD state is probed ( ). Then, the voltage is scanned from the gate bias V g = −1 V (empty QDs) up to 0.6 V (completely filled QDs). The amplitude of the measured transients is directly proportional to the electrical DOS of the QDs. Hence, the conductance amplitude in dependence on the applied emission bias can be used to measure the DOS, as shown in Fig. 5. Six individual charging peaks of the s and p shells of the dots can be resolved, in agreement with results from the standard C–V spectroscopy . Moreover, the real-time measurement yields a higher peak-to-valley ratio than the capacitance data, and the clear charging signal from the QD states confirms that the transients in Fig. 4 are caused by electron tunneling from the many different particle states into the self-assembled QDs. In conclusion, we have demonstrated that a 2DEG can act as a very sensitive detector for hysteresis and time-resolved measurements on self-assembled QDs. In such transport measurements, the clear identification of the QD states and the possibility to rule out a defect-related influence is of central importance. We have demonstrated two different evaluation methods—one for the hysteresis and another of the time-resolved measurements—that enables us to identify the QD electron tunneling in the measured transients and the charge storage inside the QD states in the hysteresis measurements. In these hysteresis measurements, we could show that the conductance change is partly due to depletion of the 2DEG in present of the charged QDs. The relative change of the conductance due to this depletion is up to 7% and should be independent on sample size and temperature. This makes us confident that it is possible to study the charge carrier dynamics of a single QD even at room temperature in the future. The authors gratefully acknowledge financial support by the DFG in the framework of the NanoSci-E+ project QD2D of the European Commission.